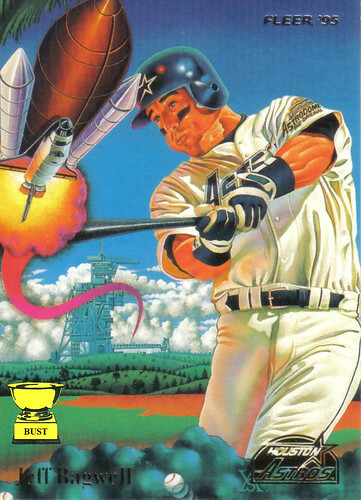 Here's a literal interpretation of the above masterpiece: Here we see Jeff Bagwell, in all his power-hitting glory, swinging as if to launch a rocket into outer space. The twist? He's hitting an actual rocket, full of tiny astronauts, carrying with it supplies for the International Space Station and the hopes and aspirations of an entire nation. The shuttle, apparently, malfunctioned, and only the mighty Bagwell could set it back on its course for great beyond, on a course for outer space — a true moonshot.